I want to write about my experiences with seeing the Psychiatrist over anxiety for a few months. Hope it helps you decide if it’s worthwhile to see one or not. Do not see a Psychiatrist for anxiety unless you can afford it over a long period of time, and that you are willing to take medication. 1) From my experiences with two different Psychiatrist, the first session is all about getting to know you. They ask you a lot of questions and note them down. It’s usually a bit longer than a regular sessions. 2) They don’t really “give advice” to what you should do, as opposed to teaching you ways to cope with your problems. 3) After the first session, it’s usually half the time, and once or twice a week (or longer depending on your situation). You have someone who really listens to your problems and someone who genuinely seem to care and want to help. They give you some helpful insight to why you may feeling anxious and relaxation techniques. For anxiety, you learn strategies to cope with your situation. One of them being that you write down a list of things you’re afraid of, and ranking them from lowest to highest level of anxiety, then you start to do each one of them, working your way up. You feel that you have time to work on, even the lowest ranked anxious thing, such as just walking down the train station (which during high anxiety times, can be difficult). You never felt pressured or as if you were crazy to take a few months just to get used to taking a few steps outside your own house. I didn’t like that I felt the only choice I had to get better was taking antidepressants for my anxiety, because I really don’t like the idea of being dependent on medication, particularly ones that “claim” they may make me feel sick if I don’t take them. From my experiences, the psychiatrist didn’t seem to think it was possible to overcome things without medication. A session at the psychiatrist feels very different from counseling. I personally preferred counseling at my old better as I just like to talk about the problem without it being too formal. 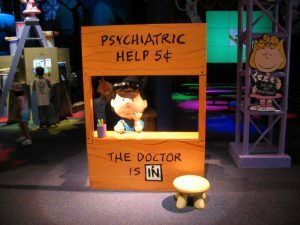 I feel that if you are desperate, willing to take any medication to get rid of your problems and have the money to do so, seeing a psychiatrist is definitely worthwhile. However, if you are like me, determined to find a natural cure for anxiety and do not like the idea of taking medication like antidepressants, and can’t really afford it, then don’t waste your money because you WILL feel that all the things they tell you can easily be googled online. Please understand I am writing mostly from personal experience. You may have had a totally difference experience than mine!